No, you haven’t woken up in an alternate reality, the newest entry in the popular series of DC Universe Original Animated Movies is based on Flashpoint, the popular, continuity-shattering graphic novel by Geoff Johns and Andy Kubert. Entitled Justice League: The Flashpoint Paradox, the PG-13 rated film is produced by DC Entertainment and Warner Bros. Animation, and will be available on July 30, 2013 from Warner Bros. Home Entertainment Group on Blu-Ray™ Combo Pack, DVD and Digital Download. Even if you’re not familiar with the source material (and if you’re not…well, you do know what site you’re on, don’t you? ), you can tell by the exclusive image above that something’s a bit off in the DCU. 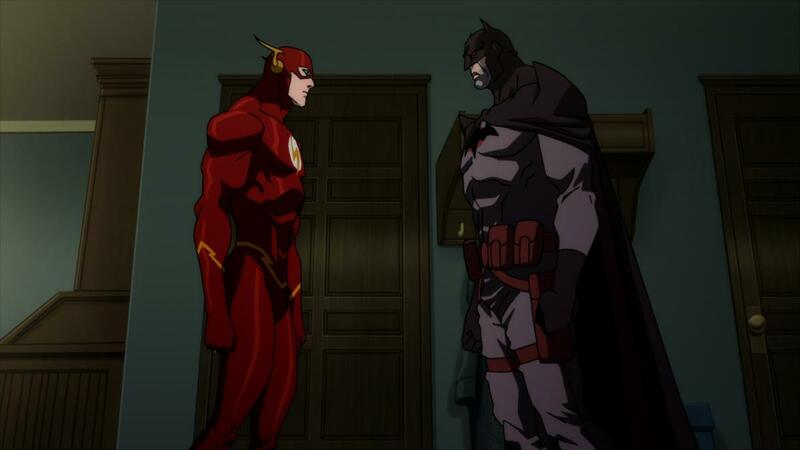 Flashpoint was a major crossover event in 2011 that led directly into DC COMICS – THE NEW 52, and the animated adaptation promises to stay true to the comic. In the movie, when time travel allows a past wrong to be righted for the Flash and his family, the event’s temporal ripples prove disastrous, creating a fractured, alternate reality where the Justice League never formed, and Superman is nowhere to be found. Amidst a new world being ravaged by a fierce war between Wonder Woman’s Amazons and Aquaman’s Atlanteans, Flash must team with a grittier, more violent Batman and government agent Cyborg to restore the continuity of Flash’s original timeline. Jay Oliva (Batman: The Dark Knight Returns) will be directing the film from a script written by screenwriter Jim Krieg. James Tucker (Superman Unbound) is producer. The voice cast includes primetime television stars Justin Chambers and Kevin McKidd (both of Grey’s Anatomy fame), as the voices of the Flash and the Thomas Wayne version of Batman, respectively, as well as Michael B. Jordan (Fruitvale, Friday Night Lights, Chronicle) as Cyborg, C. Thomas Howell (Southland, The Outsiders) as Professor Zoom, Nathan Fillion (Castle) as Green Lantern, Ron Perlman (Hellboy) as Deathstroke, Dana Delany (Body of Proof) as Lois Lane, Cary Elwes (The Princess Bride) as Aquaman, Danny Huston (Magic City) as General Lane, Sam Daly (The Office, The Daly Show) as Superman, and Kevin Conroy (Batman: The Animated Series) as Bruce Wayne’s Batman. And if somehow that voice cast doesn’t get you excited, consider the following… While this movie features the Justice League, the story is largely driven by the Flash. So for any of you Flash fans who have been hoping the Scarlet Speedster would get his moment in the DC Universe spotlight, this is your summer. Be sure to let us know what you think of this upcoming release in the comments below. But most importantly, be sure to keep reading THE SOURCE and visiting DCComics.com for more great features on Justice League: The Flashpoint Paradox and the also upcoming Superman Unbound over the weeks and months ahead!